If you have a laptop, it almost surely has wireless (wifi) capability. The key to getting online with your laptop is a wireless network adapter. And I'd be surprised to find a laptop less than ten years old that doesn't have one built in. If not, you can buy a USB wireless adapter for around $20. All you need to get online anywhere is a WiFi "hotspot". A hotspot is a wireless router, connected to the Internet, that lets nearby computers connect to it and get online. WiFi routers broadcast radio signals in all directions by which a laptop with wireless capability can connect. If you have high-speed Internet access in your home, you probably have a Wifi router already. If you are unable to connect to it, the wifi feature may be turned off, or it may be password protected. You should also have an on/off switch for the wifi on your laptop. If those clues don't get you there, ask your Internet provider for help configuring your router for wifi access. If the problem is a weak wifi signal, there are a variety of things you can try to improve it. 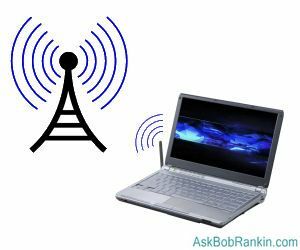 See Ten Ways To Boost Your WiFi Signal. Many WiFi routers in homes, carelessly or deliberately, provide Internet access to every neighbor and even to strangers who park near the home containing the router. If you're using wifi in your home, make sure you read my related article about The Wifi Security Mistake You Must Avoid. If you don't have a wifi signal in your home, or you're looking for internet access on the go, you've got options. Many coffee shops, restaurants, libraries, book stores, and even pool halls offer free WiFi to attract customers and keep them on the premises. Just open your laptop and check that little wireless network icon in your System Tray to see available networks. Each wifi network will show whether it is free (unsecured) or requires an encryption key (password) to use. Note that even after you connect to an unsecured network it may still ask for a username & passsword, or payment to access the service. You could walk the streets with your laptop open, in search of a wifi hotspot. But people will stare. Instead, use a portable keychain-sized device that tells you if there are WiFi networks nearby and if any is unsecured. These devices cost around $15 to $75; the more expensive models have wireless network adapters and even signal boosters built into them. They're very handy for office-less nomads. And if you have a smartphone, you can always use that to check for nearby wireless signals. Many independent Web sites maintain lists and maps of WiFi hotspots. One of the best is JiWire's Wifi Finder. Many nationwide chains of familiar brands offer free WiFi to their in-store customers. Barnes & Noble book stores offer free WiFi, as do most Starbucks and McDonalds locations. The downtown areas of many major cities offer free WiFi. A college or university is a dependable sign that free WiFi is close to you. Fast food places, bars, and any kind of store that wants kids to come in and spend money will offer free WiFi; it's like spreading sugar for ants. There are some potential gotchas when it comes to free public wifi and the security of your personal information. Check out my article The Big Problem With Free Wifi Hotspots to make sure you're not exposing yourself to hackers and identity thieves. Cellular phone providers such as Verizon, AT&T, Sprint, and T-Mobile offer mobile wireless internet services for a fee. Portable gadgets called mobile hotspots (or mifi devices) convert a cellular data signal into a wifi signal, so your laptop can stay on the Internet while riding in a taxi or bus, or even in the middle of nowhere (as long as you can get a decent cellular signal). This saves you the trouble of searching for a WiFi hotspot, and having to drink gallons of coffee to stay connected all day. Of course, you have to purchase the mobile hotspot device and pay a monthly access fee. There's also the smartphone option, which works in similar fashion. If you have a smartphone with mobile internet access, it can act as the mobile hotspot, and broadcast a wifi signal, allowing a laptop, tablet or ebook reader to get online. The problem is that not all smartphones have this feature, and even when they do, sometimes the carriers disable it or charge customers to use it. I've used my Samsung Galaxy S3 on the Verizon network with a free app called "Portable Wi-Fi Hotspot Free" to beam a wifi signal to my laptop while at the airport or in a hotel room. You may need to do a bit of research to see if your phone and/or carrier allows for free mobile hotspots. There are also some companies that offer limited free wifi access. My article How to Get Free Wireless Internet goes into detail on those services. Disqus: Bad for Public Discourse? Most recent comments on "Wireless Internet Access for Laptops"
$20 a USB WiFi dongle ? Under $6 at and yes, they work perfectly at that price ! I use one on my Raspberry-Pi. I have used wefi for several years and it is free and has never caused me any problems. It connects me to the hottest free wifi signal and shows me the rest nearby signals, their strength, and which are open and which are locked. You state, "use a portable keychain-sized device that tells you if there are WiFi networks nearby." Could you elaborate on these devices(like name-brands) and where to find them. EDITOR'S NOTE: I don't have any advice on brands. But you can find plenty by searching for "portable wifi finder" on Google or Amazon. Most public libraries have free WiFi and many offer printing as well.